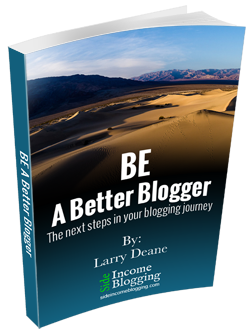 One thing I’ve wanted to do for a long time here on Side Income Blogging, is offer a free eBook for people that subscribe to my newsletter. When I say a long time, I mean a long time, like 3-4 years. A few weeks ago I finally decided to pull the trigger, and started the process. 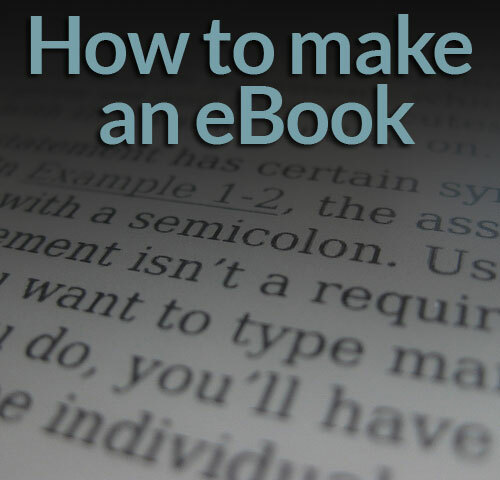 Here’s the really simple, and effective process I used to make my very first eBook. I believe the best way to “get in the pool” is to jump in head first. A few weeks ago, I was looking over a few old SlideShare presentations I had, and found one that I thought would make for a great eBook. Over the past few years, I had read a few eBooks on how to write eBooks, and even downloaded a few templates to use. I was ready. Before I could talk myself out of it, I quickly pulled up Apple Pages and just started writing. But I’m jumping ahead. What would help your readers? This is where my idea came from. I had readers that were struggling with how to proceed with their blogs. I decided to create an eBook to help them. Scope out your competition. Take a look at your competitors, and see what types of eBooks or free resources they are offering. Of course don’t copy them, but use their eBooks to help come up with some ideas. Tell your story. Do you have an interesting story about how you started blogging, or how your website came to be? Share that story with your readers in an eBook. Whatever idea you decide to move forward with, make sure that it benefits your blog’s audience. If the eBook won’t provide benefit, than you are just wasting your time creating it. Move on to another idea. There are a number of good Word Processors, don’t get hung up here. Just pick one. They all provide the same basic formatting capabilities and export to PDF functionality. If you don’t have the money to purchase a word processor, use Google Docs. For my eBook, I used Apple Pages, as I read a number of eBook creators liked it and there were some good free and “for purchase” templates available. While I like Apple Pages, I do have a bit of a love/hate relationship with it. As a long time user of MS Word, migrating to Pages is a bit of a challenge. There are a number of free eBook templates available online for all of the popular word processors. Don’t try to start your own from scratch. I used this free template for Apple Pages, but spent a bit of time modifying the styles to fit my own personal preferences. By using a free template, you’ll most likely have to do the same, especially if you are more particular about look and feel like I am. If you are opposed to purchasing a template, this website has number of very professional MS Word templates for purchase. Some of these are really nice, and make me wish I had MS Word for my Mac. I focused on writing my eBook content first, then circled back around and formatted it. This worked well for me, as it kept the ideas flowing and allowed me to focus 100% on creating the content. I even wrote some of the book using Evernote, and then pasted the final text into the template. This kept me from getting distracted by formatting and Word Processor issues. I also outlined the book before I began writing the text. I thought of all the chapters, and sub-chapters I wanted and typed them into the template first. Then I went to each section and wrote the content. I did modify the original outline as I flushed out the content some, but having the high level flow and main ideas for the book defined prior to writing the core content really helped. I additionally set myself a goal to complete the eBook and published this target date here on Side Income Blogging. I wanted my target date to be public, so it would encourage me to make it. I then blocked off time each day just for writing my eBook. That way nothing else would take priority or intervene. I finished the book almost a week ahead of schedule. I think the level of planning I put into this eBook project was a significant factor in finishing early. Once the first draft of the content was complete, I modified the styles and made the eBook look the way I wanted. Once the content and formatting was in place, I pulled up Adobe Photoshop and developed a cover graphic and a header graphic for the eBook. I used Flickr Creative Commons to find a stunning image that represented the theme of my book, “steps”. I chose an image of a sandy mountain region, with footprints walking through the sand toward the mountains. I then blended my Side Income Blogging branding, including my logo, fonts and site colors at the bottom below the “stunning image”. I used the combination of these two as my cover image. I wanted people to be able to immediately recognize my brand from the cover of the book. I found a set of free for use stepping stones on DeviantArt that I used for the header graphic. Again, this kept with the theme of “steps”. I also used this free Photoshop Macro to create a 3D looking book cover to use no my website. Be careful about the graphics you use and be sure to comply with any requirements. If you are creating an eBook to sell, many creative commons and “free” works cannot be used in “for sale” or commercial products. A cover graphic is not required, especially for a free eBook, but it certainly does make the book look more professional and appealing. If you don’t have Photoshop, just hire a designer on Fiverr. There are a number of designers out there that specialize in eBook covers. While I’m a little embarrassed to admit this, I wouldn’t even have thought to include a copyright and disclaimers page in the book. Fortunately I had recently been reading a number of eBooks from Steve Scott and saw that he puts them in all of his ebooks. I found free copyright pages and disclaimer examples on various websites by just doing a little Googling. If you want to save yourself some trouble, feel free to copy mine – Just make sure you change the site name. You only need the FTC disclosure if your eBook contains affiliate links. Mine did, so the FTC items were included. Next to writing great content for your eBook, editing and proofing it is your next most important step! I don’t know why, but I have some mental block when it comes to typos and grammar issues on my own content. I can literally read my content 100 times, and still not find all of the issues, even though they are incredibly obvious. I did actually read over my ebook at least 10 times. On the first 3-4 passes, I rewrote a few things, and even added and deleted items. I tried to make the book as concise as possible, but also informative and valuable. That is a fine line to walk sometimes. The next 5-10 passes were just looking for spelling, typos and grammar issues. I also passed the book along to some family and online business friends to proof as well. They found a few more issues, that I quickly fixed. I thought it was done and ready to go. Wrong. Even after all of that review, the eBook still had a number of typos and grammar issues. If you downloaded the eBook on the first day I announced it, you probably saw the issues. I think I’ve fixed most all of them now. I was mortified…. In hindsight, I should have taken one more step in the proofing/review process, and hired a professional proofer. I found a few on Fiverr and bookmarked them for future use. Seriously, this would have cost me maybe $15 dollars, and I could have saved myself some embarrassment. I uploaded mine to a dedicated directory on my server using FTP. You could also upload it using the WordPress Media function, or even use some of the available download plugins. I then went to MailChimp, and edited my Welcome Email to include a download link for my subscribers. I tested the download link and the welcome email to make sure they were working. Next, I typed up a quick email update to my subscribers with the subject line: “My new eBook” and made them aware of the new eBook, and included the download link. This was done so that my existing subscribers could download the eBook if they wanted. Then I headed over to my website and created a Newsletter page so I could link to it from my eBooks, social media, and other places. I also spent a few hours modifying the various subscribe forms I have here on Side Income Blogging. I changed the title, and added the 3D Book cover graphic I created. My subscribe forms are in the sidebar, on the Newsletter page, and at the bottom of each and every post. The actual process or writing, creating and making the ebook available was much easier than I expected. The hard part was coming up with a good idea, or at least one that seemed like a good idea for me. I wanted to create something unique. I thoroughly enjoyed the process of writing the eBook, and have already started on another. I plan to sell the next few I create using on Amazon Kindle. Have you considered writing an eBook, to either sell or giveaway? Stop thinking about it, develop a plan and get started. Once I set my mind to it, the whole process took about 3 weeks for me, and that’s only spending about 6 hours a week on it.